I recently posted a summary of the Portfolio Rebalancing Software Panel from the Tools and Technology Today (T3) Conference that took place in Miami last month. The responses from the four vendors were very informative and I thought it would be interesting to hear from a few other vendors who couldn’t be part of the panel. The first vendor I contacted was FolioDynamix. They have been wracking up some impressive customer wins with Cambridge Investment Research and LPL Financial signing on to deploy their wealth management technology platform. FolioDynamix is also the engine behind the block trading and rebalancing functionality in Pershing’s NetX360 product. For this article, I spoke with Aaron Schumm, who was recently promoted to the position of Chief Customer Officer. I asked Aaron the same questions that were posed to the T3 panel and he was kind enough to provide the following answers. What are the main differentiators of your product? The FolioDynamix trading and rebalancing tool (FDx Manage) has several differentiators that resonate through the fee and commissioned-based trust and brokerage industries – all of which contribute to increased productivity, efficiency and insight, Schumm responded. It is cloud-based and integrates seamlessly with existing internal and external systems across multiple custodians. It also monitors 30 types of drift and cash movements for accounts, he said. Their alerts dashboard allows portfolio managers to rebalance all of their accounts in a single trade scenario, Schumm continued. Since scalability and visibility are critical to their clients (LPL Financial for example), FolioDynamix designed a highly-scalable rebalancing engine that allows for multiple accounts to be linked to multiple models, which are held at multiple custodians and can be traded and executed simultaneously, he stated. According to Schumm, their platform is tax-aware and automatically checks for wash sale violations, restrictions, minimums and replacement securities. FolioDynamix also follows custom trade workflows for orders over defined amounts, discretionary, non-discretionary and commission-based accounts. Finally, FDx Manage seamlessly interoperates with the other modules of FolioDynamix SingleSight wealth management technology platform – allowing firms to deploy a single cloud-based system to support the entire wealth management life cycle, he noted. How do you convince advisors who still rebalance manually that software automation can do it better? 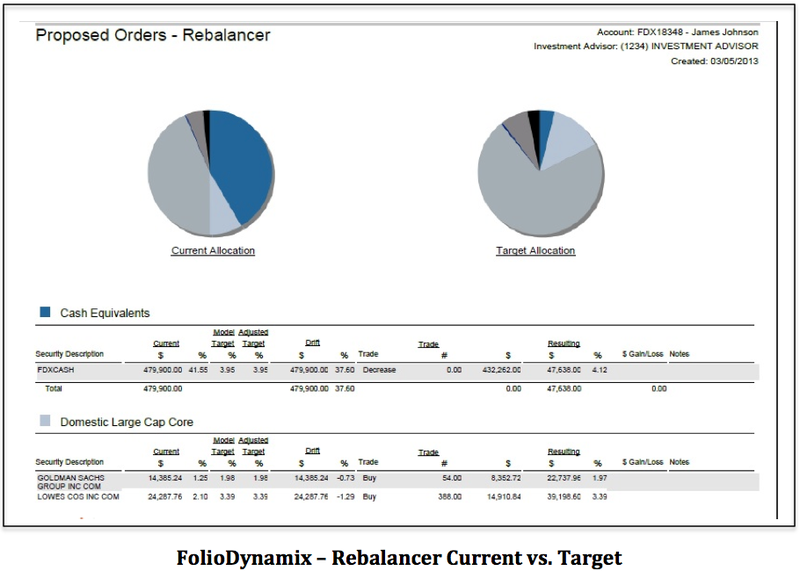 The automated rebalancing capability of the FolioDynamix platform removes the risk of a miscalculation that is common in manual rebalancing, while automatically checking for wash sale violations, upcoming anniversaries, account restrictions, appropriate tax lot sells, and replacement securities, Schumm explained. Their tool creates recommended trades that are in line with the model and additional constraints, keeping the client in line with their target. It also allows an advisor to tweak the recommended orders, adding a personal touch, if desired, he said. Can you provide a real-world example of the efficiencies that your product brings? Can you describe your level of integration with external systems? The FolioDynamix FDx Manage module, which includes an array of trading capabilities – order entry, manual trade, security swap, trade-to-target, rebalancing – integrates seamlessly to external systems across multiple custodians, Schumm confirmed. Connections to custodial systems are established following each custodian’s recommended method, and all trades can be sent to multiple executing brokers and custodians in a single block. FolioDynamix has electronic trading connectivity to all major custodians, including Fidelity, National Financial, TD Ameritrade, Thomson Reuters BETA (TTS), SunGard AddVantage, FIS, Pershing, and others, he said. The FDx Manage platform cost varies, depending on the functionality and services offered, Schumm concluded. They usually work within their clients’ pricing models, either on a per account, user or AUM basis. Their target clients are banks, broker-dealers and RIA’s with over $700M in assets, he stated. Does your product update portfolios using real time prices before rebalancing? Yes, the FolioDynamix system pulls real-time security prices before rebalancing, with each user having their own profile configured to use real-time or delayed quotes, depending on their preference, Schumm advised. Can your product help advisors to build their own investment strategies? Yes. Since FolioDynamix is also an RIA, they can provide assistance in model creation, product selection, overlay management and trading for those clients wishing to leverage that level of service, Schumm explained. Does your product have customizable asset classes to support long/short strategies? Yes, FolioDynamix can provide customizable asset classes for long/short strategies, Schumm noted. What is the average implementation time for your product? Schumm explained that this depends on the platform tools and investment services that a client selects, since the implementation timelines can vary. Due to the use of cloud-based deployment and pre-built connections, FolioDynamix can have an out-of-the-box implementation of their trading and rebalancing tool completed in about 30 days, he claimed. They recently launched a large client with over 10,000 users and several million accounts in four months, with customized trading capabilities included in the implementation, Schumm reported. The average implementation time for their complete wealth management platform, depending on the complexities, number of custodial connections and custom configurations is from 3-6 months, he said. What other features do you offer that set you apart from your competitors? FolioDynamix is the only vendor in the industry that has built an integrated platform on a single code base that manages the entire client life cycle and supports all core wealth management functions – from proposal generation to account opening to model management to trading/rebalancing and trade order management to portfolio accounting to client performance reporting, Schumm asserted. I didn’t debate him on this point, but I believe that Fiserv’s wealth management platform provides similar functionality, although there are stark differences in the approach that they take in their respective underlying architectures, user interfaces and advisor workflows. 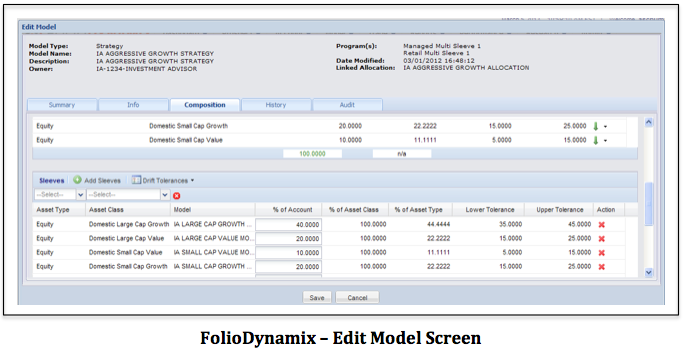 The FolioDynamix wealth management platform has the capability to manage multiple programs (i.e. UMH, UMA, SMA, MF/ETF wrap, non-discretionary, discretionary, hybrid, and commission-based accounts) across multiple custodians in a single instance, Schumm continued. The system spans both the trust and brokerage worlds seamlessly at the household level and provides firms with a true open architecture solution, he said. Their support for both discretionary and non-discretionary on the same platform is one of the greatest benefits of the Folio platform, in my opinion. While there has been a shift of advisors from commissions-only to fee-based due to regulatory concerns and hopes for steadier revenue streams, the non-discretionary business isn’t going away anytime soon. Firms that support both models or have hybrid advisors that do both would much prefer a single platform rather than two. What is your recommended frequency for rebalancing? This depends on the end clients’ needs, goals, and trade management guidelines, Schumm replied. The system automatically monitors for drift violations, security movements, cash receipts & deliveries, and anniversaries nightly, he said. Does your product support hierarchical modeling (models of models)? Yes, this is inherent in the FolioDynamix architectural design, Schumm acknowledged. Their solution even takes it to the next level – allowing reps to manage a portion of the account, while allocating the remaining parts of the account to an overlay manager, strategist or asset manager, he said. What is your company’s policy for post-implementation technical support? FolioDynamix pride itself on client support, working with their clients on program development, training, roadmaps, feedback, and concerns on a daily basis, having direct access all of us at the firm, Schumm noted. They also host an annual client conference to encourage interaction and networking among their client base. What new features do you have in the pipeline for 2013? Unlike the vendors at T3, Schumm was forthcoming about their new functionality plans. He described that several feature enhancements are on the way, including household-level drift monitoring tools, additional client performance reporting features, enhanced commission brokerage trading features, new tax harvesting tools, and enhanced electronic account opening workflows. T3 Conference: Which Financial Planning Software is Right For You? T3 Conference: Which Portfolio Rebalancing Software is Right for You?